This is usually useful if you are not the only one using the computer you are working on and want to hide the keywords you searched for on the Windows Explorer. The way to do it is to open the Local Group Policy Editor by entering gpedit.msc into a Run... prompt, browse this key on the left frame: User Configuration\Administrative Templates\Windows Components\Windows Explorer and left-click it once to see its values on the right frame. 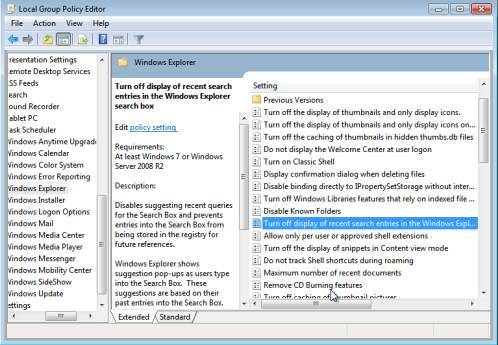 Look for Turn off display of recent search entries in the Windows Explorer search box. Double-click and enable it. The recent search queries will now no longer be displayed in your search bars.